Next week is Homecoming Spirit Week! No school on Monday. Dress up day for Tuesday is "Country Day"! Each day of spirit week, there will be TWO winners for "Most Spirited." Winners will each win a Yazoo Pass gift card and a point for their class. On Holiday Day, there will be a point awarded to the "Best Group Costume." We have selected Spring Initiative, a local after school program that serves the at-risk youth of Clarksdale, for our Homecoming Fundraiser this year. The class that raises the MOST money for Spring by Friday during Homecoming week will earn THREE points for their class and the second place class will earn two points, and the third place class will earn one point. Donations should be turned in to your class sponsor beginning Tuesday. Hallway decorating will take place on Monday beginning at 1 PM. Talk to your class representative or staff sponsor about how you can help! 12TH PRESIDENT- LUCY HEATON, VICE PRESIDENT- ASHLEY RUSSELL, SECRETARY- MEAGAN WHATLEY, TREASURER- OLIVIA WATTS. The senior class is selling tickets for a catfish supper to be held at Lee on Tuesday, October 18th (pickup only) 5:00-7:00. This is to help fund graduation expenses. Ask any senior for a ticket. 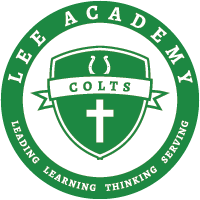 Flu Shots will be given at Lee Academy on October 11 starting at 1:00. All Softball uniforms and helmets must be turned in today. Varsity Football game tonight at Home vs. Indianola Academy. Game time is 7:00. GREEN OUT GAME, FANS WEAR GREEN! GO COLTS! SENIOR NIGHT- all Seniors who play Fall Sports will be recognized before the game. (6:30) Seniors and their parents need to be on the football field by 6:30.